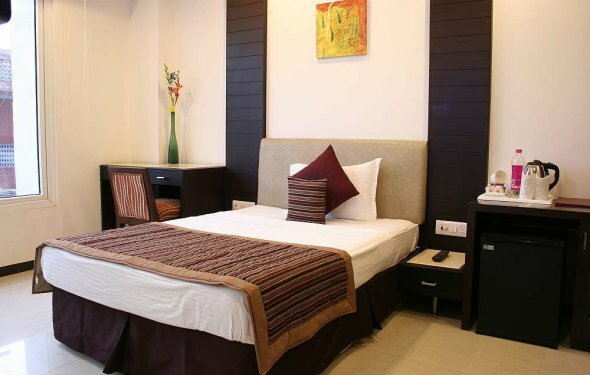 Nirual's Hotel is a three star property, catering to the requirements of business travellers as well as tourists visiting Delhi and NCR (National Capital Region). Conveniently located at Sector 2 in Noida, the hotel provides an easy access to tourist attractions and business centres of the National Capital Region. Nirula's Hotel is located close to Gol Chakkar in Sector 2 of Noida, Uttar Pradesh. IGI Airport in New Delhi is the nearest airport from the hotel, approximately 35 km away. Hazrat Nizamuddin Railway Station in New Delhi is about 10 km away from the hotel. The local bus stand is adjacent to the hotel. Nirula's Hotel has two banquet halls, which can be utilised for conferences, business meetings, workshops, parties and other related events. The hotel also has a fully equipped business centre with personal computers and essential business amenities. Other facilities and services available at Nirula's Hotel include a travel desk, laundry service, secretarial service and car rental service. Nirula's Hotel has 40 well-appointed guest rooms that have been categorised as Deluxe Standard rooms, Deluxe Superior rooms, Executive Standard rooms and Executive Superior rooms. The centrally air-conditioned rooms are equipped with modern amenities and offer a fine blend of comfort and cleanliness. Common in-room amenities include cable television, telephone facility, mineral water, tea/coffee maker, internet access, and an attached washroom with hot and cold running water supply. Room service is also available at the hotel. At its family style restaurant, Nirula's Hotel offers a wide menu consisting of delicious Indian thalis, curries, breads and kathi rolls, and international cuisines like pizzas, burgers and footlongs. Besides these, at the restaurant, guests can enjoy 100% vegetarian Nirula's ice cream, shakes, sodas and sundaes. The Nirula's Pastry Shop offers a vast array of pastries, savouries, condiments, bakery products and delectable cakes. Adjacent to Nirula's Pastry Shop is the coffee shop 'The Book Cafe', where guests can sit and enjoy a cup of coffee along with popular books and magazines. 'The Pegasus Bar' at Nirula's Hotel serves invigorating Indian and International liquors and wines accompanied with snacks and tandoori items. Complimentary buffet breakfast is served to guests from 7.30 am to 10.30 am. Customized buffet meals are arranged by Nirula's Hotel on request.